Some dogs are born paralyzed, others may become paralyzed due to an accident or old age. Either way, if it happens to your pet, you'll need the best dog wheelchair. Wheelchairs will allow your dog to stay mobile, even without the use of his hind legs. * Click on the best dog wheelchair brand for more information, prices and details. Or below to read reviews. Other than a sudden traumatic accident, dogs going through rehabilitation often have very tired, weak or non-functioning back legs. Other canines may have an extra bad case of dog arthritis, other joint problems such as hip displaysia, or they may simply get really tired in general. You don't always need to use a wheelchair for dogs in those cases, but often times, it may help your dog recover quicker, according to studies. Disabled dogs who are struggling to move require the limb support that their dog owners can provide through a variety of technology, first of which is of course is by using the best dog wheelchair that fits your pet, or some specially designed pet wheelchairs, or a proprietary design of a rear wheel dog wheelchairs which are usually harder to find. These “machines” will let your canine receive the necessary exercise that they require in order to live a very happy, active, fulfilling, healthy lives. With some of these best dog wheelchairs we've listed below, your pet will be able to use their front legs in order to move around, run fast, explore areas, play with you and even other pets. When should wheelchairs for dogs be considered? Wheelchairs for dogs may not always be the first or best option. Before you spend the money on the best dog wheelchair, you should know whether or not it will benefit your pet. Seeing your dog lose his mobility, whether due to old age or an accident, is nothing short of traumatic for a dog owner. It's imperative to work closely with your veterinarian during this time. If your dog is slowly losing his mobility with age, talk to your vet as soon as you notice any changes. They'll be able to help you cope with the changes and get you set up with a plan that will help your canine companion say mobile for as long as possible. This may or may not involve the use of wheelchairs for dogs or other assistance measures. You may have assumed that the best dog wheelchair would be helpful for any canine with paralysis in his hind end. Unfortunately, this isn't always the case. Dog wheelchairs are usually helpful only in very specific cases, which your vet will tell you about. In order for your dog to be able to use a wheelchair effectively, he'll need to be able to support himself with is front legs. Sometimes, especially with older dogs, the front legs aren't strong enough to support the pet and pull the cart along. Therefore, wheelchairs for dogs that are much older and/or suffering from arthritis may not be a good option. How do you know if your dog is able to support himself in a wheelchair? The best way to test your dog's front end strength is to make a sling and gently lift his hind end off the ground. You can make a simple DIY dog rear leg sling with a cloth grocery bag by following the steps in this quick video. If your canine can support himself with his front legs, a wheelchair for dogs may be a good aid for him. Consult with your veterinarian to get their opinion, and ask about any recommendations they may have for any wheelchairs for dogs to meet your pet's needs. If you think any of the options on this list may be appropriate for your Fido, discuss them with your veterinarian as well before making a purchase. What is the Best Dog Wheelchair? The Walkin' Wheels Dog Wheelchair can be very vital in improving the quality of life of dogs with mobility disabilities. This particular model is designed for dachshunds and other small dogs suffering from weak hips or hind legs, amputated limbs or degenerative diseases affecting their ability to walk or move. The material used for the frame is aluminum, which makes this best dog wheelchair a very lightweight contraption. There are push-button adjustments for the height, length and width. Though generally designed for dogs weighing less than 25 pounds, the sizes vary by leg measurement and actual weight of the dog. Sizes range from 1 through 6. Three colors are available for this best dog wheelchair. What pet owners find remarkable about the Walkin’ Wheels Dog Wheelchair is the utmost flexibility that it offers. It doesn’t require the buyer to make complicated measurements just so the wheelchair would fit perfectly. The click-on harness and aluminum frame is adjusted to get the height, width, length and fit that will be most comfortable to the user. The wheels are designed to traverse any kind of terrain, and this makes this wheelchair a very useful support for weak- to non-functioning hips or legs. This wheelchair has made it possible for paralyzed pets to be able to walk and run again. Some of them had been immobile for so long, and this wheelchair came as a major life changer. They took to it quite easily, and now they’re raring to tackle more mileage and explore their surroundings like never before. K9 Carts Read Support wheelchair for dogs is surprisingly very lightweight and has a sturdy, no-rust metal frame which will make you feel confident about the leg support your dog will receive. Comfort level is decent as well, with high quality neoprene dog harness attached to both front and rear of this third best dog wheelchair. The K9 Carts is veterinarian-designed, built and tested, so you know it will definitely help your dog who's going through rehabilitation or has a serious case of canine arthritis. You can use the harness for running and having an active day out with your pet. It's very easy to use, put on your dog, adjust and then take off. This is a quality construction made in the USA. While this dog cart is extremely high quality, it's also very expensive (the most expensive on the best dog wheelchair list here). Moreover, some owners have also reported their dogs not taking a liking to this specific wheelchair for dogs. Thus, if you're considering this pricey dog wheelchair, it's best to ensure your dog will like it (test at the store). This wheelchair from Best Friend Mobility is truly the best mobility companion for dogs that have difficulty walking or moving their hips and hind legs. The whole cart assembly is non-rust. It has an aluminum frame, galvanized bolts and hardware, padded neoprene shoulder support, EVO neoprene leg harness, fixed padded seat, and durable rubber all-terrain wheels. The cart’s length can be adjusted using a hex wrench to 32.25” maximum. The height with wheels is 21.5” adjustable to + /-5”. The width of the cart is constant at 10.5”, but with the wheels, the Best Friend Mobility Dog Wheelchair will occupy a width of 21”. The wheel is 14” in diameter – big enough to go over rocks, hills, and creeks. The adjustability in height is a very good feature about this best dog wheelchair. Aside from the fact that it makes the fit more customized to the dog’s height, it also makes it possible to choose whether to allow some use of the hind limbs or let the wheels do all the work. The harness can partly support the weight while letting the hind limbs still do some work to prevent atrophy. If that's not possible, the dog’s rear can be fully hoisted so that the paws don’t touch the ground at all. In either case, it must be noted that this wheelchair is designed for dogs with front legs that are fully functioning. Walkin’ Wheels for small dogs, which appears on top of this list, has a counterpart for German Shepherds, St. Bernard, Great Danes and other large dogs up to 180 pounds. There are five sizes and three colors available. Sizes vary with the dog’s leg length measured from the fold of flank of the upper rear leg to the toe pad. Like its small version, this is made of a lightweight aluminum structure, and fitted out with a durable and fully-adjustable harness and stirrup supports. Dogs regained their independence with the Walkin’ Wheels Dog Wheelchair. They are now able to move around by themselves, chase critters, and pee or poop on their own. Dogs, too, need some freedom and privacy, not to mention that their humans now have one less chore to do, namely the unpleasant task of cleaning up poop. This gave hope to dogs that had weak hips or hind legs but are not totally paralyzed. Walking with their weight supported by the wheelchair provides their legs the much-needed exercise to strengthen muscles. Aside from that, tasting how it is to be back on the road and be playful again motivates them each day to continue moving. If your dog seems like one that needs to sit or rest every once in a while during a walk, then skip over the first three items from the top of our list and check out Best Friend Mobility’s SitGo Dog Wheelchair. As the name suggests, this design is revolutionary since it allows your dog to sit or go while still attached to the wheelchair. The rear of this best dog wheelchair can be lowered to allow your dog to step in or out of it, so there’s no lifting required whatsoever. It is made of a non-rust aluminum assembly, stainless steel hardware, clip-on neoprene front and rear harness, and PU all-terrain wheels. The SitGo is available in four sizes from XS through L. Finding the right size for your dog can’t be more straightforward. With your dog standing, assisted by another person naturally, measure the height along your pet’s hindquarters from the floor to the dog’s back. To give you an idea, for a measurement of 9”-14”, that should be the small size. For a height of 20”-29”, that should be the large size. It’s so simple, and it’s one thing that pet owners like about the Best Friend Mobility SitGo Dog Wheelchair Revolution because simplicity in sizing often indicates how flexible an item is. The most important thing to pet owners is, of course, how this walking support has given joy to their canine family member. These dogs are often at the final chapters of their lives and fighting battles with age and illnesses. It’s more than enough for dog owners just to see their pets walking in this best dog wheelchair, leaping like they had no issues, resting when they need to and going off on their own again. They all agree that this is beyond amazing and definitely worth its price. The HuggieCart company is a specialist when it comes to fabricating the best dog wheelchair. They even produce four-wheel dog wheelchairs, should your dog need one. This particular model and make, however, is for small dogs weighing 18-40 pounds with functional front legs. The measurement from the dog’s belly to the ground must be less than 11” to fit this model, but smaller and bigger sizes are available. The frame is made of heavy-duty aluminum, and it is fitted with an adjustable neoprene chest harness, rear leg stirrups, and smooth-rolling wheels. The HuggieCart is easy to assemble. Pet owners observed that after assembling this wheelchair it could be further adjusted in length, width, and height to perfectly fit their dog’s build. Even dogs of the same breed and weight have peculiarities in their build and shape. This full flexibility makes it easier to customize the Huggiecart Dog Wheelchair for Small Dogs to every dog that uses it, and dog owners really find that a well-thought-out feature. The optional stirrups at the rear hold the hind legs higher to prevent these from touching the ground. Adjusting the height lower allows the legs to touch the ground and do some movement. The latter is often recommended by therapists to prevent atrophy of the muscles. Significant improvements in their physical condition were noted, yet the biggest impact has been behavioral. Aging and ailing dogs are once again young and eager for life. Last, but certainly not least, on our list of the best dog wheelchair is the Newlife Mobility Adjustable Dog Wheelchair. It is available in five sizes for dogs weighing not more than 100 pounds. It is also constructed of durable and lightweight aluminum with notches and screws for adjusting the height, width and length. It’s worth noting that the smallest size is made for dogs weighing less than 5 pounds. That’s the smallest wheelchair on our list! The dog’s weight and the distance from the floor to the dog’s back are the bases for determining the size of the wheelchair needed. Dog owners found it easy to place an order with only the weight and hip height to consider. Minute adjustments can be made later for a tailored fit to the dog. All that’s needed is a hex screwdriver for loosening and tightening the screws and a little patience when adjusting the height, width and length. The frame of the Newlife Mobility Adjustable Dog Pet Wheelchair is sturdy and well-constructed, and pet owners are confident that it would serve as a very reliable support for their pet’s weight and movement. The harnesses and stirrups are made of soft yet durable materials that are adjustable to ensure that the dog is not unnecessarily strained. Dogs quickly took to this cart and easily figured out the best way to maneuver it over different terrains. This is both very functional and inexpensive, and for these qualities, it continues to be a hit to people who own dogs with rear-leg or hip disability. How dog wheelchair works and why use them? Dog wheelchair doesn't prevent your pooch from anything: they will still be able to go to the bathroom while your dog's rear legs are touching the ground very slightly, or maybe they are safely lifted up in stirrups. It depends on the type of best dog wheelchair you pick and use to assist your disabled dog friend. Studies also show that wheelchairs do indeed help dogs a lot in rehabilitation. Some best dog wheelchairs are fairly adjustable, and have simple buttons that snap, their universal frame expands in width and also in length and even height to accommodate a dog of any size. Certain dog wheelchair will be interchangeable and have snap-in wheels and struts. All of this is needed to use the dog wheelchair on canines both big and small, so you could adjusts for the most perfect fit. Certain dog wheelchairs are already created to fit either small sized dogs, like Best Friend Mobility's wheelchairs, or medium to big sized dogs, such as their Medium sized wheelchair. Most of these options listed in the above list of best dog wheelchair review do not require measuring your dog, and you can adjust the pet wheelchair as you fit your dog into it. Best dog wheelchairs are often approved by veterinarians, used to help your pet with their hip and leg issues, as well as the fairly common and annoying degenerative myelopathy (DM) disease. 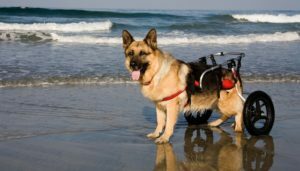 Dog wheelchairs also help dogs and cats with hip dysplasia, arthritis, paralysis, slipped disc, soreness, spinal and neurological problems, surgical recovery and many other similar problems. If you're having issues with getting a particular type of the best dog wheelchair, you can also try something like dog support & rehabilitation harness – it also works. In the end, all of these options can help your dog deal with canine arthritis, other dog joint problems, or if you dog cannot walk or is going through rehabilitation. Using one of these best dog wheelchairs is the easiest, best way to provide support for your pet. It's your turn. Have you used any of these machines we've listed in our top best dog wheelchair review? How did you and your pooch find they, and did they work well? Previous articleCan Dogs Eat Buckwheat?